Age-related Macular Degeneration is an age-related, degenerative condition of the retina. This problem arises when the central retina called macula gets damaged resulting in defective central vision. People with damaged central vision find it difficult to read, see and recognize the faces. AMD effects only central vision but not peripheral (side) vision. In most of the cases, AMD affects both the eyes, though the problem in one eye can be more than the other. If AMD is left untreated, it becomes severe and may permanently damage the central vision. In people, over 60 years of age, AMD is very common disease, which leads to vision loss. 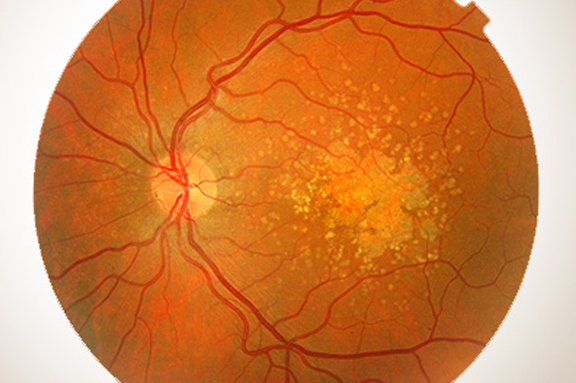 Age-related Macular Degeneration is of two types, DRY AMD & WET AMD. DRY AMD: It is the most common type seen in around 90% of AMD cases. It occurs when age-related deposits such as drusen form under the retina. Further, dry AMD results in thinning of central retina and gradually leads to central vision loss. The risk of developing advanced AMD can be reduced with the help of specially formulated vitamins. 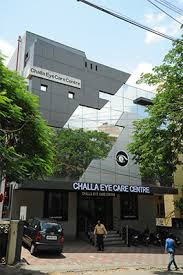 We, at Challa Eye Care Center provide you the best treatment and medications that prevents the progression of DRY AMD. WET AMD: It is a severe type of AMD and not so common in people. Wet AMD occurs when new, unusual blood vessels grow under the retina and results in bleeding, fluid leakage, and scar tissue formation, which damages the central vision. The problem of Wet AMD increases quickly, however, if identified early, there are many treatment options available at Challa Eye Care Centre to stabilize the vision &reduce the risk of losing more vision. Further, we perform tests such as Fluorescein Angiography and Optical Coherence Tomography (OCT) to get a detailed view of the retina. In Fluorescein Angiography, a yellow dye is injected into a vein in the arm, this dye quickly spreads into the blood and hence into the vasculature of the eye, with a special camera photos of retina are taken to identify any abnormal new blood vessels in the retina. To treat Dry AMD, we provide, nutritional supplements and specially formulated supplements that decrease the risk of developing advanced AMD and arrests loss if vision. Though the above nutritional supplements prevent the progression of dry AMD, they don’t cure it. Based on the patient’s medical conditions and AMD severity our retina specialist s at challa eye care advice the best treatment option. To treat Wet AMD we inject Anti-VEGF medications into the eye. These medication prevent the growth of abnormal blood vessels under retina, which is the major cause of wet AMD. Wet AMD if not treated in time can lead to rapid loss of vision, which can be permanent.